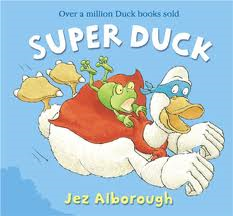 This month’s Virtual Book Club featured author is Jez Alborough. Each month participating bloggers select a book from the featured author and create an activity to accompany the book. 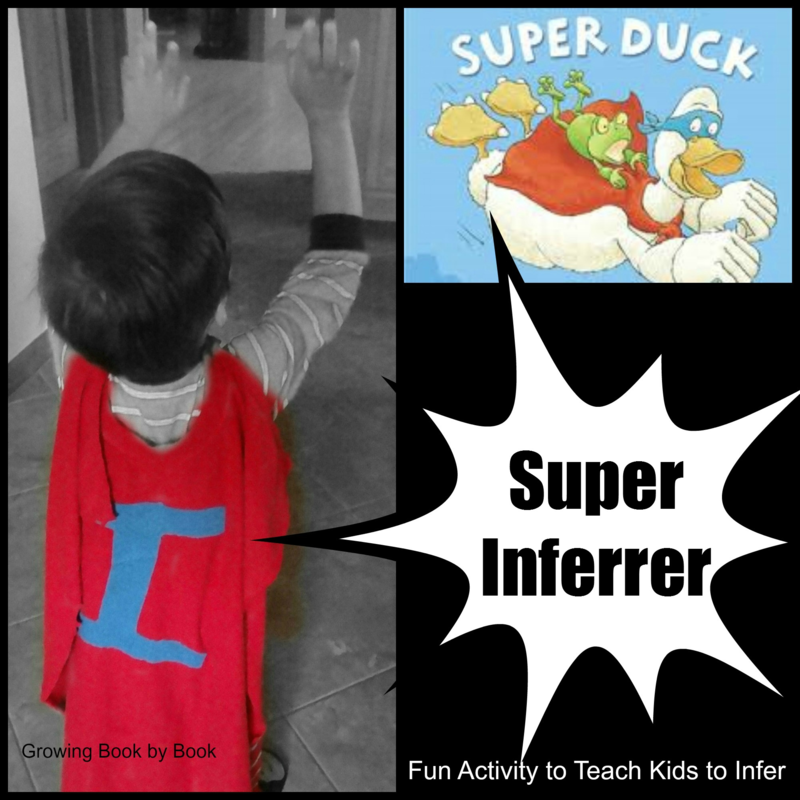 This month we chose Super Duck and came up with a fun activity to teach kids how to infer. Super Duck is the tale of a duck who steps in to rescue a frog from a kite flying adventure. The rhyming text and bold illustrations had my kids giggling all along. This book just begged an activity that involved a super hero. So, we came up with an inferring super hero activity. Inferring is an important skill that proficient readers use while reading. When you infer, you “read between the lines”. Inferring involves marrying your past experiences/knowledge with evidence from the text. I believe that inferring can be taught at a young age. This activity is designed for younger and older children. I talk about adapting the activity for different age groups below. So, let’s be a “Super Inferrer”. First, you need your super red cape. I found this simple cape idea on Pinterest from The Southern Institute which is made from an old t-shirt. I then used fabric glue to attach a letter “I” on the back. You will also need a set of clue cards. Each card will lead the child to a new location in the house (or you could do this outside). Clues should be written so that the child has to infer where to find the next location. We were on a hunt to find a hidden teddy bear since we also read Where’s My Teddy by the same featured author. These were our clues. Click here for a downloadable clue cards. Welcome to your rescue mission Super Inferrer! Will you be able to save Teddy? Get ready! You will find the next clue in a dark place where spoons, forks and knives rest for the night. And now your next clue! Glue, paint, scissors and construction paper are all around. Can the next clue be found? Good job Super Inferrer! Fly off to the area where your wet shirts and socks are waiting to dry. You are getting closer to Teddy! Look under the place you rest your head at night. Could Teddy be floating on his back playing with his rubber ducky? Finally, place your clue cards in the appropriate places and put a teddy bear in the bathtub. You are now ready to have your Super Inferrer venture off on their rescue adventure! Have them don their cape and set off on their mission. We started at our front door. For younger children, you will need to read each clue. You can also add picture clues to assist them on their adventure. Older children can read the clues on their own. Tell the child that they will need to use the text and think about their own experiences to figure out the clues. This activity will give your child great practice on a skill that they will be able to transfer over into their own future reading. Please visit the bloggers listed below who also selected books by Alborough and created activities to accompany the titles. And, if you have a post related to the feature author, please link up below. Are you following Growing Book by Book on Facebook? If you haven’t liked us, please do so! We have some great conversations about literacy on the page. I also share some of my great literacy finds from other bloggers. You can also join the over 2,000 people following my Pinterest boards. This is another great treasure trove of ideas. If you still can’t get enough of Growing Book by Book, you can follow on Twitter, Google + or subscribe to the RSS Feed. Don’t you just love feeling so connected to Growing Book by Book? What a fun way to teach an important skill. What a fun activity! Hug and Yes are two of my favorite books to read with emergent readers- Jez Alborough is one of my favorites! 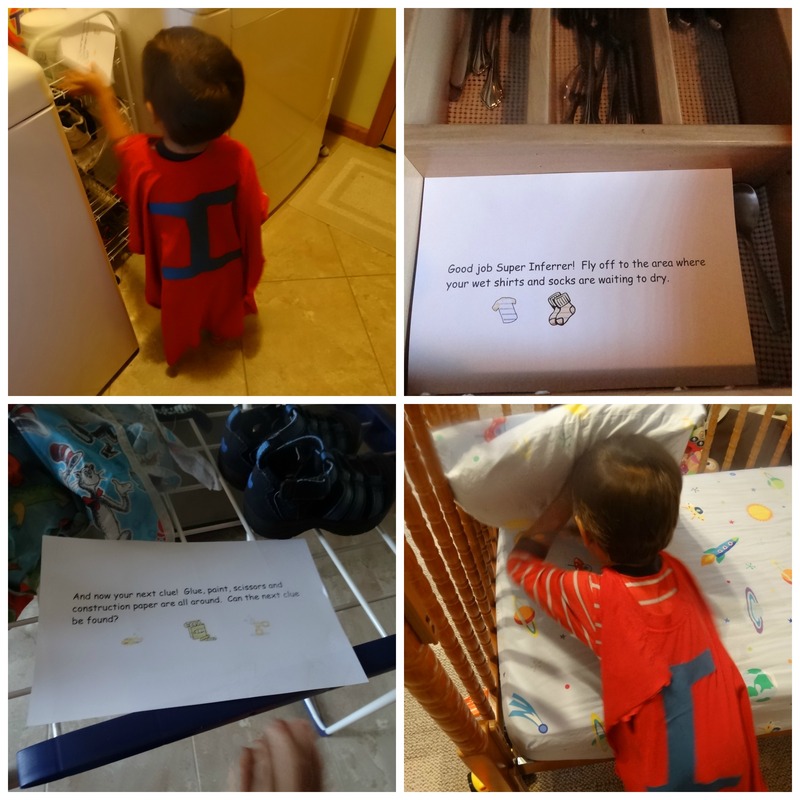 Oh yes, inferring SO needs a super duper cape :)) I love the activity but I must admit, I would like a cape first 🙂 Thanks for sharing Jodie. We are fans on FB. Tracy, I think a pirate map hunt would be a great idea! What a great activity! What better way to learn than by having fun and learning at the same time. Yes, we love to have fun while learning!